Nov. 27: My advance copy of Dolly's Little Sparrow arrived over the weekend, and Dollymania again has the first review of the CD published anywhere! To read it, click here. * The Knoxville News-Sentinel had a great article Sunday about Dollywood dressing up for the holidays. To read it, click here. * Some of the kind folks in Amory, Miss., where Dolly headlined the Stars Over Mississippi concert in October, have an abundance of programs featuring Dolly left over from the show. These are being sold for $5 each plus postage, and every sale benefits the scholarship program which the concert funds. To learn how to get yours, e-mail kpholmes@intop.net. Nov. 24: Dolly was as fabulous as ever co-hosting the Grand Ole Opry's 75th anniversary special on CBS Thursday night with Vince Gill (photo at left courtesy Debbie Poole). You knew you were guaranteed a great show when you have the host of the CMA Awards and the hostess of the ACM Awards together on one night. Keeping the humor up with her self-effacing jokes throughout the night, Dolly lit up the stage, and she was paid her respect as one of the legends of country music. A clip of her and Porter singing "The Last Thing On My Mind" played in the segment honoring the genre's top duets. She received a standing ovation after performing a medley in tribute to Roy Acuff at the old Ryman Auditorium ("Wabash Cannonball," which she dedicated to her father, "Blue Eyes Crying In The Rain," "Night Train To Memphis," "I Saw The Light"). She and Vince did a wonderful duet in honor of Hank Williams on "Hey, Good Lookin'," although Vince was visibly embarrassed with Dolly's flirting during the number. 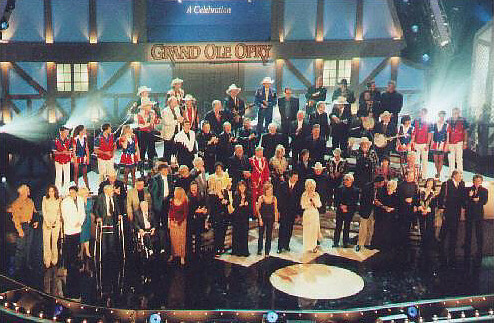 Dolly sang "Coat of Many Colors," dedicated to her mother, in the segment honoring Country Music Hall of Fame members, and joined fellow Hall of Famers Loretta Lynn, Charlie Pride, George Jones and Little Jimmie Dickens on Pride's "Kiss An Angel Good Morning," for which the five received a standing ovation. Finally, she and Vince led the entire cast in "Will The Circle Be Unbroken." Nov. 23: You can now advance order your copy of Dolly's upcoming Sugar Hill release Little Sparrow! Simply click on the image at left or here! It will be released Jan. 23 and is on sale for $12.99 CD, $9.49 tape! * ClickTV has a great story on Thursday night's CBS special with Dolly co-hosting to celebrate the Opry's 75th anniversary. To read it, click here. Nov. 22: Country.com is playing up the Grand Ole Opry birthday special Thursday night, which Dolly co-hosts with Vince Gill on CBS, with a front page article which includes several special clips from the show, including a vintage Porter & Dolly performing "The Last Thing on My Mind" (still shot from clip at left). To read the article go to Country.com, or to go directly to the clip, click here. * And for those looking for tickets to Dolly's December concerts at Dollywood, I saw a few up for auction at ebay, but they appear to be getting rather pricey! Nov. 20: Dolly was the keynote speaker last week at the International Association of Amusement Parks and Attractions convention in Atlanta. Chosen to speak before the 500-person crowd of park professionals due to the success of her 100-acre Dollywood, with 2.3 million visitors last year, she told the Atlanta Constitution Journal prior to the speech: "At first I was kinda nervous, addressing these kinds of people. I'm not used to being in front of business folks, but in 16 years I think I've learned enough to talk about my experiences both good and bad for half an hour." To read the full story from Friday's paper, click here. * The new issue of Rolling Stone has ranked the top 100 pop songs of all time according to music critics at the magazine and MTV, with Whitney Houston's 1992 cover of Dolly's classic "I Will Always Love You" at No. 40. To read their profile of the song, including what Dolly told the magazine about Whitney's version, click here. The songs are also being featured in a special series on MTV over the next two weeks, with the episode containing "I Will Always Love You" scheduled for Saturday, Nov. 25. * Country.com has opened a special site for the Grand Ole Opry's 75th birthday, including some areas dedicated to Thursday night's special on CBS hosted by Dolly and Vince Gill. To see the site, click here. * Speaking of the Opry, Dolly was briefly featured on Sunday's A&E special documentary on the anniversary. She was mentioned only a couple of times, and then there was a one-minute segment on her as the prime example of the few "superstars" to come from the Opry. * Around the middle of last week, Dollymania's front page passed 85,000 visitors. Thanks to all who've stopped by and all who return each day! Nov. 16: Dollywood is showing up all over the place on television, with mentions on shows airing on all three major networks in the past year, even if many references are in jokes. An article detailing the free publicity for Dolly's park may be found in the Knoxville News-Sentinel here. Nov. 14: In a sad day, Dolly's father, Robert Lee Parton, 79, passed away Sunday in a Knoxville hospital. Our prayers are with the family. To read his obituary in the Knoxville News Sentinel, click here or for their story, click here. Funeral arrangements will be private. Nov. 13: Dollywood last week announced it is one of the first theme parks in the nation to implement OmniTicket technology for online ticket sales. The technology ties the ticket purchase to the park's ticketing system � instead of how ticket sales are handled through most online outlets where a salesperson must manually process the order � thus streamlining the ticket ordering process. Marketing Manager Amy Owenby said in a press release: "We're very glad to be able to add this new feature to our Web site and to offer this additional purchasing option for our guests. We've worked with OmniTicket to create a true online ticket selling system, something that very few places in the world are doing right now." Although Internet sales are currently limited to one-day admissions, plans are to add season passes and other ticket types in the future. To order a ticket, visit the park's site or OmniTicket. * My friend Justin, who operates a Sonya Isaacs page here, tells me that Sonya recently talked up Dolly's upcoming CD during an in studio appearance at WSM in Nashvulle. Near the end of the program, she mentioned that Dolly has a really great song, "In the Sweet Bye and Bye," on the upcoming bluegrass/acoustic album Little Sparrow and noted that it was done really well and was really pretty. She also mentioned that she and her sister, Becky, sang on two songs on the CD. To hear the interview, go here. Thanks, Justin! Nov. 8: To the left is what I'm told by Jennifer at Sugar Hill Records will be the cover art for the Jan. 23 release of Dolly's next CD, Little Sparrow, just at a different distance from the camera. Thanks, Jennifer! * My friend Debbie (who provided the Opry photos posted here last week) has a home video she took of Dolly at the football game in Sevierville, Tenn., and around town in Amory, Miss., earlier this year which she is selling. The three-hour video is $50 plus $3.20 shipping. To order a copy, e-mail her at pink_butterfly@chartertn.net. Nov. 1: Thanks to Debbie for this great shot of Dolly and Vince hosting the taping of last week's Grand Ole Opry 75th birthday special, which will air on CBS on Thanksgiving. (For a shot by Debbie of the full cast, click here.) Thanks again! * On the same subject, I'm told that Dolly's song selection for Sunday's taping of a tribute to Roy Acuff at the Ryman Auditorium for the special was a medley of "Wabash Cannonball," "Blue Eyes Crying In The Rain," "Night Train To Memphis" and "I Saw The Light." Thanks, Justin! * The online news magazine Salon on Tuesday published an absolutely wonderful profile about Dolly. Read it here! * In a special commentary piece last week by Owensboro, Ky., reporter Keith Lawrence, he reviewed the Bluegrass Awards, noting: "But then, there's Dolly Parton . . . Parton won album of the year honors for her first bluegrass album, The Grass Is Blue. What makes that exciting is the fact that many bluegrass traditionalists resented the album. Heck, there are country music traditionalists who are still mad at Parton for going Hollywood 25 years ago. Bluegrass Unlimited magazine had several letters to the editor from irate fans this year complaining about Parton's album getting airplay on bluegrass shows. But it was a bluegrass album. And it really was the best bluegrass album last year."